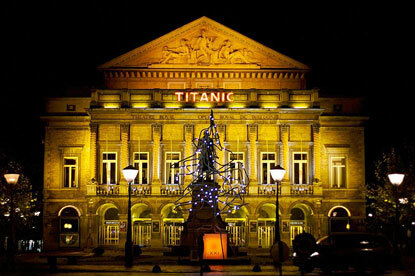 The modern centre of Liège was once an island, and the great boulevards (Avroy and Sauvenière) waterways, which were filled up in 1835, soon after the independence of Belgium. Most of the shopping streets and restaurants are now located in that area (see Shopping & Entertainment), as is the new cathedral. Starting south of St Lambert Square, on the other side of the Galeries St Lambert, is the Collegiate Church of St Denis (founded in 987). 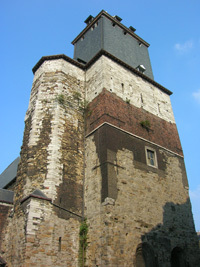 Built around 1015, its Romanesque tower was once part of the city's fortifications. The Gothic apses and transept date from the 14th century, while the interior was remodeled in the 18th century. Once you have seen St Denis, follow Rue de la Cathédrale westwards until you reach the cathedral's square. 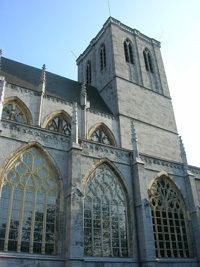 St. Paul's Cathedral was founded in the 10th century, like the other main churches of Liège. The present edifice dates from the 13th century, but was heavily modified in the 19th century. 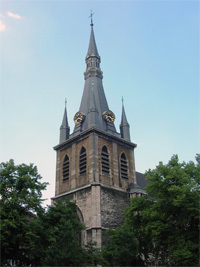 It replaced St Lambert as Liège's cathedral in 1801. 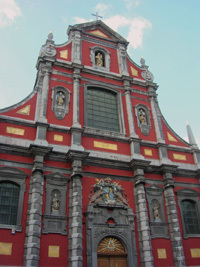 It is rather small by Belgian standards, because it was not originally intended as a cathedral. The vaulting and the cloister adjacent to the cathedral are nevertheless exceptional. 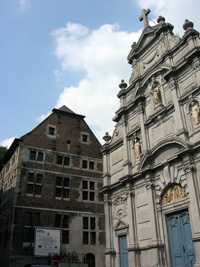 In the cathedral's cloister, the Treasure of the Cathedral of Liège, (main entrance at 6, Rue Bonne-Fortune) houses the most valuable pieces of art from the old St Lambert's Cathedral as well as from St Paul's Cathedral (note that other objects are in the aforementioned Museum of Religious Art and Mosan Art or Archeoforum). St James's Church (église Saint Jacques), a few hundreds meters due south of St Paul, is yet another of the original churches founded a millenia ago. St James is often considered to be the most beautiful of all. It was not founded by Notger, but by his successor Balderic II, in 1016. It was then a Benedictine monastry, and exceptionally enough, the abbots wore the mitre and the cross (like bishops), and was answerable directly to the Pope. The modern edifice is Flamboyant in style, apart from one portal rebuilt in Italian Renaissance style in 1558. The vault is said to be one of the most wrought in the world. The magnificent stained glass windows date from the 16th century. Before the French Revolution, it is in this church that the two elected mayors of Liège came to swear to defend the municipal rights and liberties, on St James' Day. It is also here that the city council negociated with the prince-bishop in case of conflict. It is a short walk from St James' Church to the Boulevard d'Avroy, the broadest and most famous thoroughfare in the city. The boulevard is so wide (100m at the widest point) that a park has been set up between the lanes in each direction. The Parc d'Avroy has the pond, some particularly nice trees. 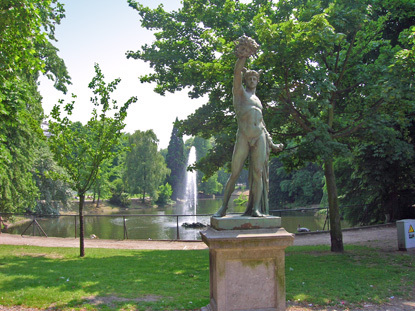 It is further embellished by numerous bronze statues. Let's note the statues of 'Charlemagne on his horse', 'the bull and the tamer', 'the horse and the tamer', 'the ox and the farmer', 'the wrestlers', 'the two Laocoons'. 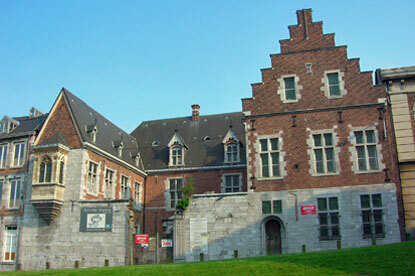 Liège's reputed Music Conservatory stands on Boulevard Piercot, near the north-eastern corner of Parc d'Avroy. In the middle of the park, the Madmusée is an unusual museum (and research centre) devoted to artists with mental disabilities. Take Rue de Rotterdam at the south-west of the park to reach the pretty Place de Bronckart. 200 meters south, the brand new Liège-Guillemins Train Station is a marvel of futuristic architecture, designed by Santiago Calatrava Valls. The construction began in 1999 and the new station was inaugurated on 18th September 2009. Liège has not revealed all of its churches yet ! Following the road uphill from the western side of the palace (Rue de Bruxelles), you will reach the Church of the Holy Cross (église Sainte-Croix), founded by Notger in 979, and rebuilt between the 13th and 15th centuries. 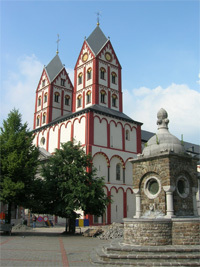 It is the only Gothic church in the country to have kept a Romanesque apse. The treasure possesses two masterpieces: the 8th-century key of Saint Hubert, and a reliquary of the (supposedly) True Cross. Continue further up along Mont-Saint-Martin, passing in front of the 16th-century Hôtel de Selys-Longchamps (which was converted in the city's only 5-star hotel, Les Comtes de Méan, in 2011), to reach the St Martin's Basilica. Notger wanted to replace St Lambert's Cathedral due to the floods that often made its access difficult, and so founded this church on higher grounds. The local population, however, staunchly opposed the decision to move the cathedral from the site of St Lambert's martyr, and after an uprising resulting in the sack of the bishop's residence, the new edifice was consecrated as St Martin's Basilica. The neighbourhood north of St Martin's, known as Publemont, is one of the oldest in the city. Many houses in Rue Saint-Severin and Rue Hocheporte date from the 17th and 18th centuries. 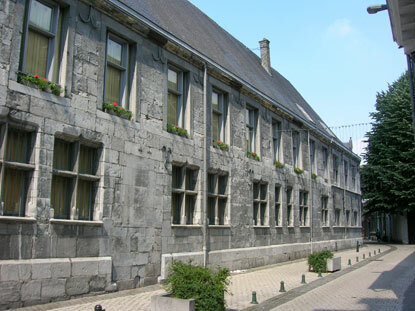 Rue Pierreuse (literally "stony street", named after the stone quaries where it once led) is one of the oldest roads in Liège, existing at least since the 8th century. It starts just north of the palace of the prince-bishops and goes all the way to the citadel. There are many buildings of interest here. Let's just cite the 17th-century commandery of the Teutonic Knights (who were present there since the 13th century).